Our local theater in South Korea has one of the first and only 4D Plexes in the world (and it is currently showing Avatar, so I could possibly be entertained and annoyed and over-stimulated all at once! Whee!). What are your thoughts/feelings on this so-called break through in the movie going experience? Does the thought of a moving seat and being accosted with sprinkling water and scent sound like an enhanced movie experience for you? Does it seem like it would just provide another barrier to your enjoyment? I’m not linking to the original source because the specifics don’t matter. This isn’t about the individual people or the individual documents involved. This is just an example of how the use of ableist language harms disabled people. Sometimes our posts on ableist language are on the abstract side, so here’s something real concrete. The ableist language is “insane” used to mean “this is bad.” The disabled people are me and everyone else who has been abused and has mental illness. It is appalling, frustrating, disappointing. It makes me want to cry every goddamn time I see it because I know my abusers are fine upstanding successful people and I’m fucked up and broken and poor. I would like, please, to not have to be the metaphor for abusers and their abettors as well as their victim. I carry enough shame already. This is why we talk about ableist language. It’s not because we hate fun. It’s not because we have no sense of humor. It’s not because we want to take people’s words away. It’s because we shouldn’t have to be the metaphors for our own oppressions. I think I upset one of the newer employees at my favourite tea shop today. Most of the staff are used to my cynical reactions to newspaper discussions of how inspiiiiiiiiiiring people with disabilities are at this point. Actually, no, let me begin with something important, since recent events have told me one cannot be too careful. There are, of course, reasons why people with disabilities and their families participate in these stories, and I certainly don’t blame them. I know if someone offered to interview… wait, I’ve been interviewed a few times now about disability, and I did leap at the chance. I don’t think that people who are interviewed for these stories are doing anything wrong. They’re talking about their lives, and describing their experiences. No, it’s the way that these things are spun, the words being used by the reporters to fill in the gaps, that is the problem. 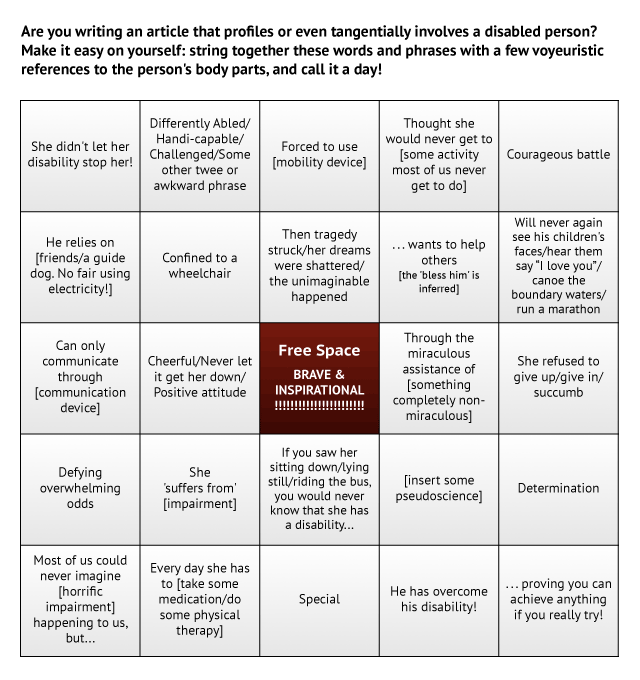 Are you writing an article that profiles or even tangentially involves a disabled person? Make it easy on yourself: string together these words and phrases with a few voyeuristic references to the person’s body parts, and call it a day! She didn’t let her disability stop her! He has overcome his disability!
. . . proving you can achieve anything if you really try! So, let’s go back to my story. A Different Victory: When Alex Bilodeau’s brother cheered his gold, the triumph went more than one way. The skier and the painter find inspiration in each other – and neither one accepts limits. Ian Brown travels to the intimate heart of a family. You know what would inspire me, gentle readers? Curb cuts being cleared of snow so Don & I could get across the street without having to go three blocks out of way first. But I guess when you’re a bitter, cynical, angry person who just hates fun, that’s what you get. 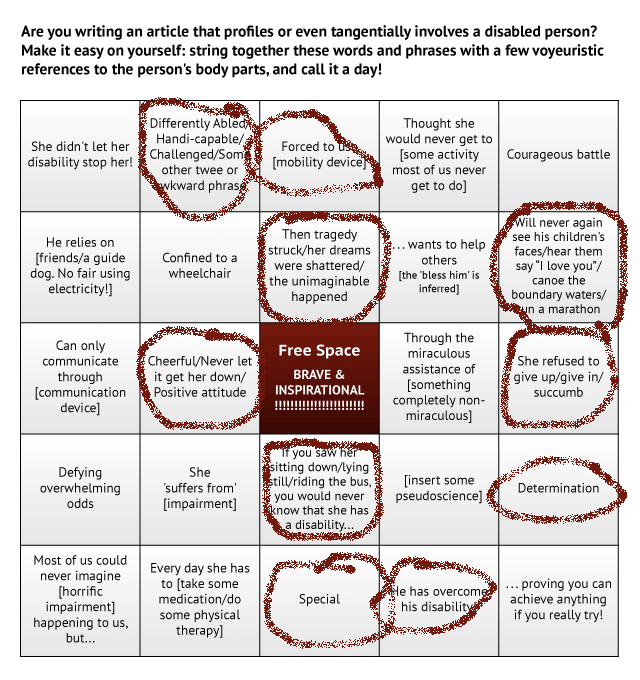 Sadly for all of us, Ian Brown’s articles don’t seem to appear on the Globe & Mail’s website (except perhaps behind the paywall), so I can’t let you read the inspiriiiiiiing story of Frédéric Bilodeau, but I can show you a BINGO card that Don & I filled out while we read it. Free Space: BRAVE & INSPIRATIONAL!!!!!!!!!!!!!!!!!!!!!!! Alexandre Bilodeau has provided something more than his magnificent gold performance (Gold Comes Home – Feb. 15). He has provided an example of the role that individuals with a disability play inspiring us as they overcome their challenges. Thank you, Alex and Frédéric. Mr Smith, with all due respect, we are not here to be your thrice-damned inspirations thank you very much. Be inspired! Lobby the Canadian government to provide funding for all universities to be fully accessible to people with disabilities! That would help lots of people with disabilities overcome their challenges! The point of this post isn’t “here I am, talking about an article you can’t read, and being as sarcastic as possible, aren’t I witty?”. It’s actually to talk seriously about the way disabled people are written about. We’re allowed to be inspiring stories of overcoming adversity – and often those stories focus on the difficulties our loved ones have, and how hard it can be to have a disabled person in your life – or we can be a passive victim of crime. That’s it. If new media actually presented people with disabilities as we actually are… well, that, gentle readers, would be actual news. ETA: facesofcathy found that Ian Brown’s article’s up over at CTV. (Why? I don’t know.) Check it out: The Bilodeaus: Elusive truths from an unforgettable family. I haven’t done a side-by-side comparison of the text (I think the headings are different?) but it look pretty close. Check out the comments if you like to headdesk over how inspiiiiiiiired people find these types of stories. Since I judge my worth the same way, I don’t really blame her. The Cult of Busy tells us that worthwhile people have full daytimers, with every minute packed. Want to do lunch with friends? I’ll have to plan that week in advance. Coffee date? Only if I can fit it in between my full-time job and my hours of volunteering. And I simply can’t agree to anything else right now, have I told you how busy and overwhelmed I am with all my important things to do? There are things I think are wrong with this pace of life for everyone (including me, but as I said, I totally buy into it), but it’s especially difficult when it comes to people with disabilities. When you value someone’s worth as a human being on how much they can squeeze into a day, what value do you place on someone who cannot do all of that? And what value do you place on people who attempt to do enough to keep up with everyone else, but fail? We value certain things in Western Society, and one of those things is How Important You Are, and how we judge that importance is how busy you are – how in demand you are – how many people want to know what you have to say. The Cult of Busy reinforces a lot of abliest ideas about who is important, and who is not, which means that the people with disabilities who can’t do It All (whatever It All is) are by default not important. They don’t count. They don’t need to be considered in how you build a business, say, because they’re never going to work for you and never going to spend money there because they aren’t important. They’re not worth including in your campaign about social justice issues because they don’t work so they don’t really contribute and even if they did, no one cares about what they have to say anyway because they aren’t important. If they were important, they’d be Busy. And Busy means something very specific: As many hours of the day filled with Stuff To Do as possible. I want to write a lot about the Cult of Busy, in a variety of ways. How The Cult of Busy feeds into the idea that people who work less than 40 (or 60 or 80) hours a week are “getting away with something” and “not actually committed to their jobs”. How if you’re not working you “should” be volunteering, because otherwise you’re doing “nothing” with your day. How we disdain people who “just sit around all day”. How people like me end up confusing “busy” with “important and meaningful” to the point where we make ourselves ill doing too many things and being torn in too many directions. Be busy. Be more. Be better. The second-wave radical feminist theologian and professor Mary Daly died earlier this month, and there has been a veritable outpouring of eulogies from various feminist blogs. Few of these eulogies have acknowledged Daly’s transphobia and racism. I do not deny that Daly was an important figure in second-wave feminism, but to mourn her passing without a nod to her work’s more problematic aspects, or explorations of these aspects, are, to put it mildly, not good. In particular, the intense, hateful transphobia found in some of her writing, and her issues with unexamined white privilege and racism — which both QueenEmily at Questioning Transphobia and Sungold at Kittywampus cover very well in recent posts — strikes many as both deeply disturbing and an old pattern that has, and continues to, rear its grotesque head in certain segments of contemporary feminism. I include myself among those who are deeply troubled by Daly’s transphobic sentiments and her questionable record when it came to examining the entrenched racism and issues surrounding white privilege in the second-wave feminist movement. I should probably mention at this point that I do not mean to appropriate or co-opt the struggles of trans* folks in any way, although my cis privilege will most likely be unintentionally reflected at points in this piece. Though the struggles of trans* people, trans feminists and PWDs and disabled feminists are not the exact same, some exclusionary tactics of certain cisgendered feminists and those of abled feminists sometimes take similar forms, especially within the mainstream feminist movement. The oppression of trans* folks and PWDs in cis, abled culture intersect in a number of ways; this post, however, barely scratches that surface. I believe that the many issues present in Daly’s work–as well as the reaction to her death around the blogosphere–can serve as just one entry point to discussions of the similarities in oppression(s) that trans* people and PWDs face. There are also clear differences, among them the fact Daly used language that can only be called genocidal, while many other feminists of her generation did not advocate such an extreme path when it came to keeping certain individuals out of feminism. I will be focusing on feminism’s exclusion of trans* and PWDs as reflected in the work of two very influential second-wave feminists here, but there is, of course, much more to these stories. Daly’s penchant for exclusion and outright hatred (particularly of trans* individuals) couched in oddly phrased academic rhetoric unfortunately brings to mind another famous second-waver’s similar issues with people (particularly women) with disabilities. Princeton scholar Elaine Showalter — best known for bringing feminist literary theory to the fore in the academy at a time when such a discipline was, for the most part, inconceivable — dismissed disabling conditions like Chronic Fatigue Syndrome, Gulf War Syndrome and mental health issues such as Dissociative Identity Disorder (referred to in the text as Multiple Personality Disorder) in her 1997 book Hystories. In Hystories, Showalter attempted to debunk “modern media epidemics” such as the aforementioned disabilities as well as more traditionally disproven phenomena such as alien abduction and satanic ritual abuse. In the book’s chapter on Chronic Fatigue, Showalter rather disingenuously declared that she did not want to “disparage the suffering” of people with such conditions only a few pages before she called CFS an extension of Western “fin de siecle [end of the century] anxiety.” She followed this stunning assertion with the claim that the Western news media was primarily responsible for making CFS into an escalating “psychogenic epidemic” (117, 131). Like Daly’s severe opinion of trans* people as dupes of the medical industry (which Kittywampus cites in her post), Showalter also seemed to be taken with the idea that people with CFS are somehow being duped into thinking that they are ill because of the media focus on their condition. She wrote that many CFS patients and their defenders are “hostile to psychiatric or social explanations” of the condition, and that many of them react in a way that is not friendly to the labeling of CFS as “psychiatric” (128). However, the reactions of these same patients make sense if considered from a non-abled perspective. Showalter also seemed completely mystified by these “hostile” reactions. If CFS is just a manifestation of “fin seicle anxiety,” as she contended (adding that “emotions have tremendous power over the body”) she seemed to push the conclusion — without any scientific or medical proof — that many people with CFS have somehow been brainwashed into believing they have it; thus, the media-driven “hysterical epidemic” has worked. Nowhere are feminists with Chronic Fatigue Syndrome or related conditions consulted; the not-so-feminist implication here is that feminists with Chronic Fatigue Syndrome either do not exist or are just victims of a “hysterical” media-led epidemic and therefore cannot be “real” feminists. This is similar to how trans* feminists were erased, excluded and castigated by Daly as somehow not “real” women or feminists, and as benefiting from patriarchy in a way that “real” women and feminists could not. To put it crudely: This is exclusionary bullcrap, and it does not do trans* people, people with disabilities, feminists who fit either (or both) of these categories, or the feminist movement as a whole any favors whatsoever. Exclusion is not radical. It has never been radical. It is, in fact, extraordinarily status-quo. No one should be able to arbitrarily pick and choose who “belongs” in the feminist movement and who does not, especially if those who are being excluded because of their gender identity, sexual identity or disability actively identify as feminist. Feminism should be for a wide variety of people; exclusion, however, is something that is not — and has never been — very feminist. Author’s note: I will be moderating this thread with an iron fist; please have the courtesy to not try to tell me how Daly really was an ally to trans* folks, or how Showalter didn’t mean what she said about CFS *that* way, or that either author’s influence on the feminist movement somehow excuses their hatred and bigotry. Thank you. This may seem like an opening for a post about being child-free, but it’s not. I often put these questions off with flippancy or a shrug or just saying we’re not interested in having kids. In my experience, this will often have people leave the issue be. Sometimes, though, people will hound and hound and hound. Do you want to know the secret way of getting people to never again ask why you’re not having children? At some point, drop into a conversation that your husband’s disability is genetic. Without fail, that has stopped every single person who has asked and asked and asked about children, even when the “genetic” bomb isn’t dropped in a conversation about having children. One of the reasons why the focus of abortion! abortion! abortion! whenever talking about reproductive rights really bothers me (and a lot of others) is because of the assumption that people like Don & I shouldn’t have children (because – oh no! – the child likely will have Marfan’s just like Don! And everyone knows people like Don are a burden on the system/have miserable lives/are never happy/can never be married/are all the same/should be stopped/are just an example for the rest of us). When people focus on reproductive rights only involving abortion, they neglect that, for people like us, the pushback is to not have children. Don’t burden the system. Think of the children – and don’t have any. The same fears are reflected when discussing women with disabilities having children (with bonus “but how will she care for the child?”), or when parents forcibly sterilize their disabled daughters. This pains me, perhaps especially as someone who doesn’t want children. It pains many other women who, for a variety of reasons, are discouraged or outright prevented from having children they want. That, in North America, these women are overwhelmingly women of colour, lower class, disabled, queer – that they’re often women who have been institutionalised in some way, be it a “medical” institution or a “criminal” one – is not a coincidence. In my experience, marginalized voices who speak out about this disparity between on-line feminist discussions of abortion and on-line feminist discussions from a broader reproductive justice framework [1. FREE Halifax: Feminists for Reproductive Justice & Equality. We meet every other Tuesday for teach-ins & movies about Reproductive Justice. Look for us on Facebook.] are often shouted down, or ignored. We’re told our issues are “special circumstances”, or “pet projects” or “in the minority” or “don’t apply to as many people” or … Well, basically everything feminists in general are told when they talk about issues that are “special circumstances” that don’t apply to enough people (read: men) to count. Frankly, I end up not knowing where to go from here. Do we, who are limited on spoons or forks or energy or time, keep trying to push for more mainstream feminist discussion on these issues? Do we form our own spaces, our own groups, and have our own discussions? Do we write blog posts that seem to dwindle down, rather than lead us all into the future? I don’t know. I know and respect people who have made each of those choices, and still others that I haven’t mentioned. But I don’t know what the right one is. It’s all in your imagination. Shut up and do your homework. Other people are worse off than you. Today I listened in a bit to the IACC conference call on “risks and prevention.” I ended up not listening to the entire thing, partly because I’m quite busy, and partly because the conference call format just does not work very well for me in terms of processing information and understanding what it’s said. And because of the different volumes at which people talk, I find myself constantly having to adjust the volume to prevent sensory overload. It is telling, I would say, that the IACC would select such an autistic-unfriendly method of holding its discussions. A chatroom, or another written format, would be much more accessible. But the main reason I stopped listening was because of the conference call’s content, and the fact that I have very little desire to expend so much effort to listen to a discussion in which I am unable to speak and disagree with the premises so profoundly. From there on, I automatically assumed that Campbell Alexander was faking. You know, the dog was just a regular dog, but the owner had a huge sense of entitlement and thought his being an attorney made him eligible for access with a dog. Even way until the near end of the book, when the dog starts barking loudly in the courtroom and Campbell refuses to remove it, I assumed that he was really feeling better than the judge. Even if it is a service dog, it should behave itself, right? I couldn’t imagine that maybe there was a reason that dog barked, until the reason Campbell has a service dog in the first place was shoved right into all other characters’ and my face. If we’re going to a place we have never been to, we must check if it is accessible. EVERY time we forget to do this, or we assume that the place will be accessible, the restaurant ends up having two flights of stairs or narrow doors. Sometimes, the staff will tell us they are accessible “but we have a few steps out front that we can help you with.” Assholes don’t even know how much my chair weighs. Plus, HELLO, dangerous! Lawsuits! If I can get into a restaurant, I will either not receive a menu (because I am just at the restaurant to look at the decor, evidently), or the waiter asks if we all want menus. Or they ask if I need a children’s menu. I’m almost certain that able-bodied folk do not experience this phenomenon, and this menu game is only done for those who look gimpy. I know, I know, I should ask for a menu if I don’t get one, right? But no, I just borrow my mom’s. I don’t feel like dealing with it. Bad activist moment. Almost one in 10 disabled people in the UK have been the victim of a hate crime, according to a leading disability charity. For the first time, the 2009 version of an annual survey carried out by Leonard Cheshire Disability asked respondents whether they had faced a crime which they felt was motivated by their disability, with 9% saying they had.